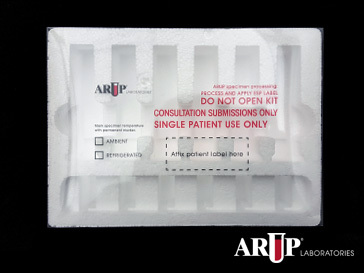 Prospective patients, while ARUP Laboratories may perform specimen testing, no ARUP facility performs the actual collection of the specimen(s). Please reference this list of blood draw locations for your specimen collection needs. The NABER will administer a national voluntary registry of neonates with ABE in the USA over a 36-month period. Qualifying infants will receive 28-gene panel sequencing at no charge.The University of Utah with ARUP Laboratories developed a 28-gene Next Generation Sequencing (NGS) panel to discover underlying genetic contributors to ABE. 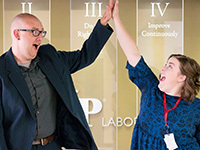 After ARUP employees responded in numbers far beyond expectations to our employee survey, ARUP became a Utah Business 2018 Best Companies to Work For Winner. We’re in good company, too. Find out more here. ARUP Laboratories now offers two kits for use when transporting Pathology Consult samples, Paraffin Tissue and Extracted Nucleic Acid samples to us for testing. Read about the transport kits here. In keeping with our mission to provide outstanding patient care, ARUP will no longer accept specimens for metals testing sent in non-certified metals-free tubes, beginning November 12, 2018.Read more here. Example patient reports, including enhanced versions of patient reports, can now be found on test pages within the Laboratory Test Directory. This time-saving feature allows you to access the helpful information found in these reports at your convenience rather than contacting Client Services. Click on the links below to view some examples of this feature. In the age of precision medicine, genetic testing has become increasingly important in the treatment of patients. ARUP is now offering a free out-of-pocket estimator for some molecular tests to assist our clients in helping their patients understand potential expenses. ARUP is the only reference laboratory that offers QuantiFERON-TB Gold Plus with two blood collection options. View all available video lectures.